Just a splash of yellow! You can wear with so many outfits and get multiple uses from this one necklace! 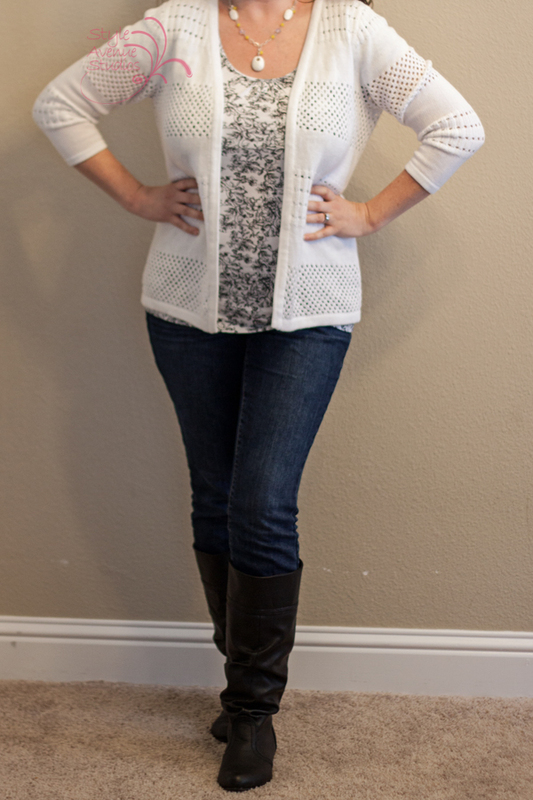 This outfit below focus on white as the primary color with black as the secondary. 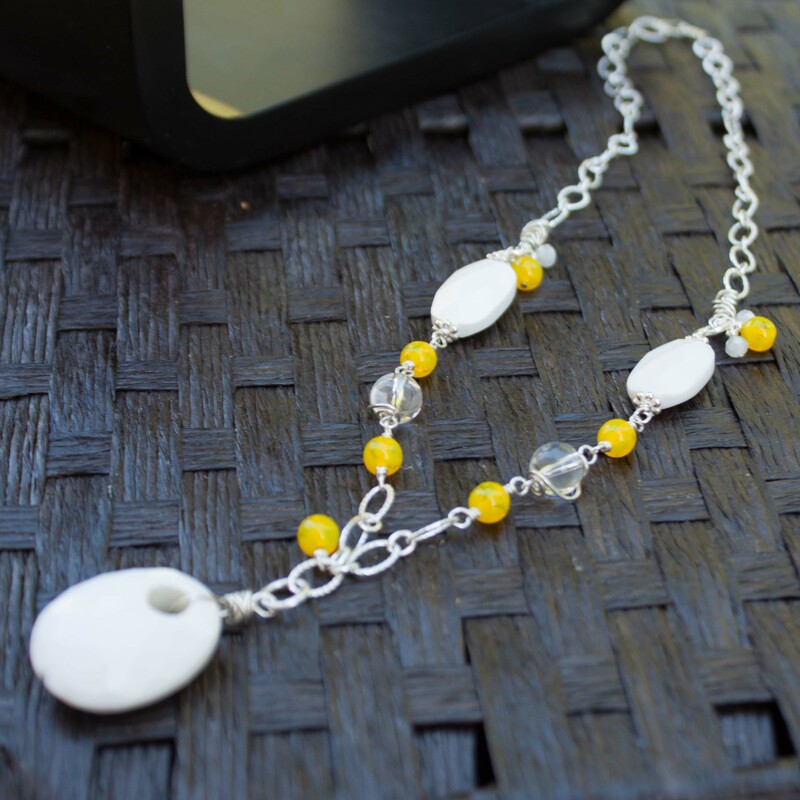 With the Yellow Splash Necklace I am able to add a 3rd accent color and it gives just enough interest. As you can tell I am on the pale side, so yellow is not my best color. 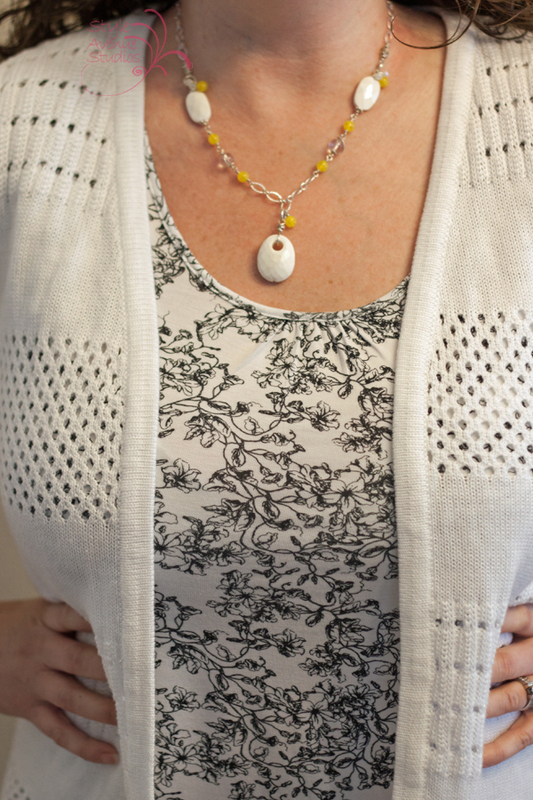 However, this necklace gives just a hint of yellow adding the perfect touch to this outfit. You can see that this necklace works well with a scoop neckline. It would also work on a high collar or boat neckline where it would rest on the shirt, as well as a V-neck highlighting the plunging neckline. What outfit would you wear with this necklace? Let me know by commenting below! If you are interested in this necklace you can click the image or get it from my Store! A very Spring like necklace 🙂 I’m not one to wear such necklaces, so I can’t tell you what outfit I’d use with it. Thanks Linda! Glad you stopped by! I love your suggestion for adding yellow rings! It would take it to another level of sophistication. Such versatility in one necklace! Super beautiful necklace, Emily. I just bought a yellow shirt so I’d wear it with that and my favorite jeans. So glad you like it! I wish I could wear that much yellow, you have a much better skin tone for that! Love the necklace! I’m thinking a navy and white combination with the white and yellow necklace. Maybe even a navy and green combination with the yellow and white necklace. Lots of options!!!! Lisa, I had never even thought of the Navy and Yellow or Navy and Green but both are inspired suggestions. Thanks so much for sharing! I think this would look great with a black top. Love your work, Emily! Thanks Delia for stopping by! I would also really love this with a black top and even some blue jeans. I think I’d add a shot of citrus with some orange to keep it very spring like and punchy. Cute outfit! Thanks so much! I love your idea of adding other citrus colors. Thanks for adding your inspiration! We’ll, Emily, I seldom wear jewelry, and I have no necklaces. But a nice yellow necktie could give me the same boost that your necklace gives you. In fact, most of my ties have a touch of yellow in them.